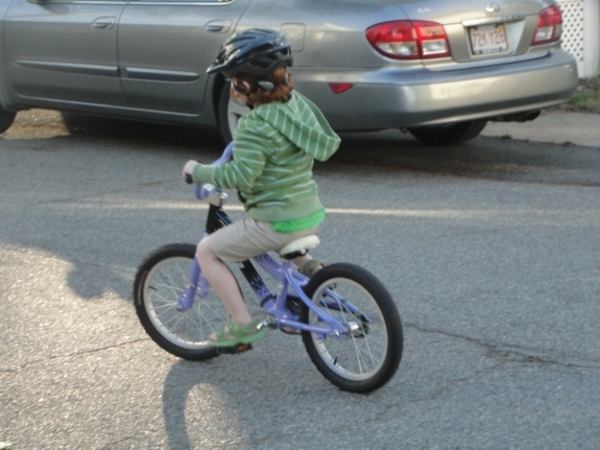 I want to write some thoughts about teaching one�s child to ride a bike. For one thing, it is sort of the quintessential outdoor activity of children. 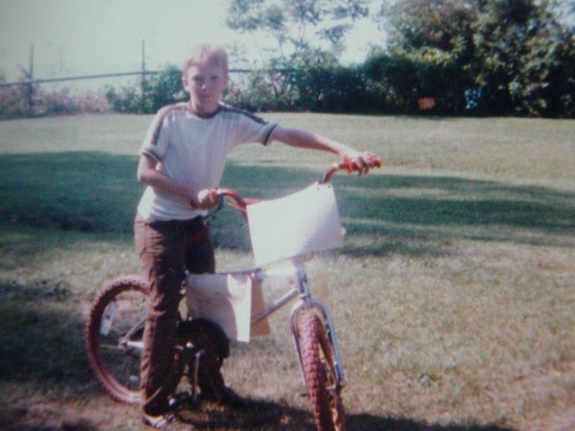 For another, I�ve been riding a bike with some sort of intentionality since 1983. Racing BMX, riding road bikes, mountain biking. Through some fluke, I even finished 3rd in a regional mountain bike race in New England a few years ago. Worked in a few bike shops. But most importantly, I just taught my daughter to ride her bike. A few scraps of theory before we start. The special thing about bicycle wheels is a little magic trick called gyroscopic inertia. Now, I never took physics class, but I�m told by smart people that this means that the faster you get the wheels spinning, the more the wheel wants to stand upright (and therefore the bike). That means going slowly and carefully is not your friend, know what I mean? Also, take a moment to think of all the tiny steering corrections that make balance happen on a bicycle. Maybe take a short ride yourself and notice how often you move the handlebars, especially while you�re going slowly. These movements take time to learn, and there�s just no getting around that. However, a second notion that may seem counterintuitive, but that speeds up this learning process considerably, is to take the training wheels off your kid�s bike and throw them as far away as you can. They teach a child nothing but to rely on the bike to stand up by itself. What does that teach you about riding a bike? That�s right: nothing at all. There�s two ways to take the next step: the expensive way, and the cheap way. Either is equally effective from my experience, and even the expensive way can be considered an investment. The expensive way involves what are coming to be called �balance bikes.� The Skuut is a popular choice, but more options become available each week. Google �balance bikes� and you�ll see plenty of options. These little bikes allow kids to begin feeling the balance of two wheels without involving chains, pedals, and all the other associated parts. I say this can be considered an investment because these are DURABLE bikes, and you won�t be wearing it out- so you can pass it along to friends or family. One of these bikes could teach almost untold numbers of kids to ride. But the thing is, you can get a small bike at lots of garage sales (we got a Trek for about $10.) and simply remove the pedals. Not only is this way inexpensive, but with air-filled tires (with some tread on them) and bearings in the steering, it is significantly more comfortable than the Skuut and many other balance bikes. All terrain! Some consumer advice: this bike needs to be on the small side, so that el nino or la nina can feel secure and able to reach the ground, jump off, whatever. My daughter was able to fit on a 16� bike for real riding, but not for this kind of use, so that Trek has 12� wheels. Helps build confidence and the feeling of safety and therefore adventure, and that�s the name of the game here. Whichever way you go: to get the kid to ride this bike you� just give it to them. That�s it. It�s so obvious what to do, that they do it themselves. If they need stability, they put their feet on the ground. If they want to move, they push with their feet. If they need to slow down to feel safe, they drag their feet. In this way, they teach themselves. Empowering, isn�t it? Now, your mileage may vary, but with my daughter, this worked best if she rode, then took a few days off. Somehow this allowed the synapses in her mind to form or something, so that the next time she tried it, she had made leaps and bounds in her riding skill while not touching the bike. Odd, but true. Anyway, they�ll begin to glide longer and longer between putting their feet down, and start to wish they had someplace to put their feet while they glide. And that, my friend, is when you know they are ready for pedals. Once they are at this point, you know what you have to do, and there�s no easy or magic way around it. You�re running along, bent in half, killing your lower back, and there�s really no better way to do it. And it has to be done again and again. And again. You�ll try other ways of holding the bike up, but I found just the one worked. All others interfered too much. But here�s the good news. Once they�ve used some version of the balance bike, they don�t have to do it nearly as long. Because they�re not transitioning from being held up by training wheels, the kid already knows balance; they just have to learn what to do with pedals. Makes more sense when you think about it, and works better in real life too. And then the magic happens. You�re standing there, aching back and all, you�ve run alongside for awhile, but your kid�YOUR kid�has just ridden fast enough that you can no longer keep up. And that sweaty, aching moment is so good that it makes it all worthwhile. Seeing the grace and the smile, hearing their excitement, and watching them fill with self-confidence and pride� It�s quite a moment.